We’ve all seen many reams worth of virtual internet pages stacked up high and bestowing the wonders of the Fuji X system, often to sickening levels. If we dare or even chose to delve deeper into the darker side of the web there are also an equal number of anti-X factor tales lurking in the low lights and sports led corners of photography websites. I’m a lifelong professional Canon shooter who specializes in cycling and adventure travel, and somewhere shortly after the dawn of the first X100 I tip-toed into the small world of the Fuji X system, and then jumped in with both feet when the XE1 arrived on the scene. Sure enough I loved the quirky X100 with a passion called hate, and the XE1 was also temperamental. From my side there was no full reliance of the Fuji’s back then, as they had proven way to unreliable and lacking in response to trust fully in crucial situations, Because of this there was always either a compact or a Canon DSLR somewhere in reserve. For me the whole point of investing so heavily (not just financially) in the X-series was to cut my pack size and carry weight, which is why I have not delved into the larger and heavier lenses in the line up; it’s counter-ethos for me, and after all, I already have the Canons for that. That said, despite the Fuji’s reliability and battery issues my Canons have hardly seen the light of day in the past 3-4 years, only coming out for maybe one major bike race a year, often as much for effect as purpose. No matter how you dress it up, when you’re being judged by the size of your armoury in a scrum of photographers fighting for very limited finish line space or motorbike slots, then a small camera and lens simply will not get you into the finals, and understandably so. World Tour level bike races are a rarity for me these days, and I’ve never been an agency or news led photographer who relies on crucial finish line shots that need to be out within minutes. My work has always been more magazine feature based, where other factors take priority, hence for much of the time the Fuji’s are great. 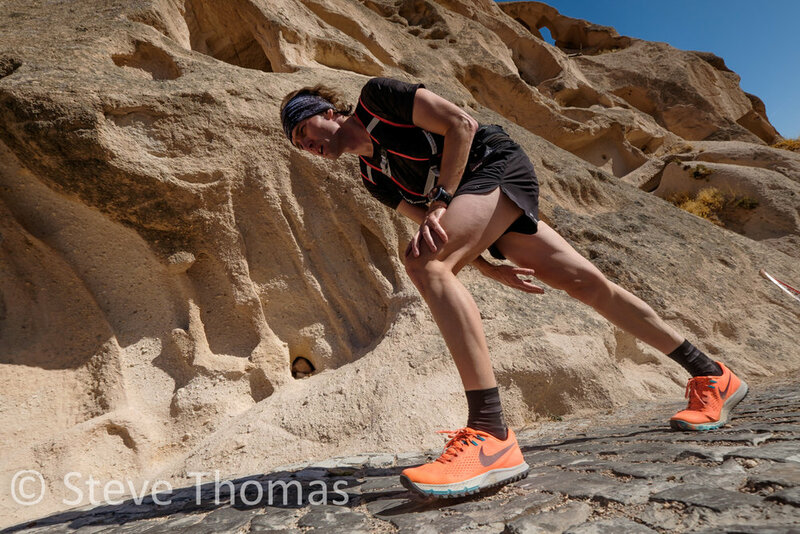 A few months back I was in Turkey, shooting a number of cycling and other events, and was scheduled to be photographer at the Cappadocia Ultra Trail running event, which is part of the Ultra Trail World Tour. Overall I knew that a lightweight Fuji system would be adequate for the job; but there were several shortfalls that gave me the jitters pre-departure. First off the long-lens situation; since converting to Fuji I’ve all but avoided long lenses – I have a 55-200mm, but it’s just way to slow (especially with auto focus) for any real action work. Secondly is battery life; the Fuji’s are abysmal here, and shooting an event that runs for 24-hours requires some forethought in power management logistics. Then there’s the poor flash situation – Fuji’s options just do not cut it (in my experience) for run and gun and constant action work. As fate would have it I was also called up for the Tour of Turkey bike race. 2 weeks before the ultra, and so had my Canon 5D3 a 24-105mm, a 70-200mm f2.8 and a flash sent over, and I ran these alongside the Fuji’s for the event (which proved to be a very wise move). When moving in action the weight difference between the systems is so very apparent, but overall it was definitely worth the strain of carrying the Canon too. The battery life of the Canon was superb and reliable by comparison – 2 batteries got me through 24-hours, and with the indication of battery life being accurate there was never any need for stressing, as I do with the Fuji’s – for which I had double USB battery chargers running full time from a support car. My usual approach for races is to have 1 camera with a long lens and another with a wide angle, which is more or less how I ran here; the 70-200mm on the Canon and 10-24mm and/or 18-55mm on my XT1. This set up enables me to double dip as the runner’s approach – a long shot followed by a close up. Working with 2 totally different camera systems and under pressure is no easy task, as the settings and menus are so very different; but in is doable – with attention. One major difference here is the EVF, and I have grown to love the Fuji for this, and do find it hard to go back to shooting blind, especially within a matter of seconds. It felt good to have the reliance of the Canon once again; I know the chances of something failing are remote, and it feels so much more positive; however – on the other hand I also love the tactile and artistic feel of having the Fuji there to get the shots I really want. Using the Canon for the sure-fire, guaranteed, shots, and the Fuji for my trademark, and more artistic shots works. As it turned out the night-time sectors and time gaps between runners all but ruled out any in-depth off-camera flash work, and the Canon definitely proved more reliable for the night time finish line shots, and I was so very glad that I had it there. Could I have run without it? Well, yes, for sure, although it would have been a very different approach, and a little more stressful on my nerves – not to mention heavier on the post processing side. Running the dual systems together under pressure is not ideal, but it confirmed to me that I would not be ditching the Canons just yet, even if they are rarely used. Having that guarantee to hand is very important for no waiver situations.